Spain boss Vicente del Bosque has won the 2012 Fifa Coach of the Year award after leading his country to their third consecutive major trophy at Euro 2012. The 62-year-old only just missed out on the prize in 2010 after guiding la Roja to World Cup glory, but this time emerged victorious after Spain hammered Italy 4-0 in the final of Euro 2012. The eventual champions were held to a 1-1 draw by the Italians in the group stages, but went on to cruise to European glory without conceding in the remainder of the tournament as Republic of Ireland, Croatia, France and Portugal were eliminated on the way to the final. Del Bosque now has two Champions Leagues, a World Cup and a European title in his trophy cabinet. Real Madrid coach Jose Mourinho missed out after winning the award in 2010 and coming third last year. The 49-year-old helped Madrid to their first Liga title since 2008 as they collected 100 points from 38 games. 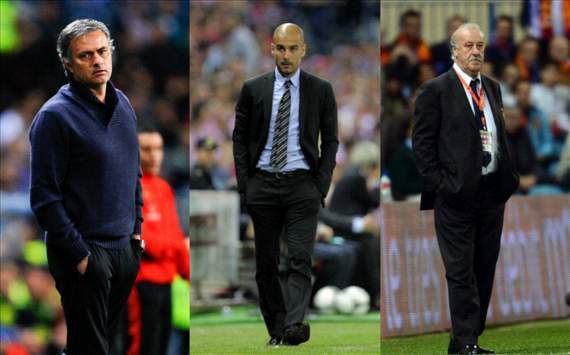 Pep Guardiola, meanwhile, had to settle for a top three spot as well after Barcelona captured the Copa del Rey.